Definition at line 79 of file llvoiceclient.h. Definition at line 436 of file llvoiceclient.h. Definition at line 272 of file llvoiceclient.h. Definition at line 513 of file llvoiceclient.h. Definition at line 257 of file llvoiceclient.h. Definition at line 518 of file llvoiceclient.h. Definition at line 490 of file llvoiceclient.h. Definition at line 95 of file llvoiceclient.h. Definition at line 302 of file llvoiceclient.h. Definition at line 818 of file llvoiceclient.cpp. References LLCallbackList::addFunction(), LLObservable::addListener(), LLControlGroup::getBOOL(), LLControlGroup::getControl(), LLControlGroup::getF32(), LLControlGroup::getS32(), LLControlGroup::getString(), gIdleCallbacks, gSavedSettings, gVoiceClient, idle(), mAreaVoiceDisabled, mCaptureDeviceDirty, mCommandCookie, mCurrentParcelLocalID, mEarLocation, mLoginRetryCount, mMicVolume, mMicVolumeDirty, mMuteMic, mNextSessionNoReconnect, mNextSessionResetOnClose, mNextSessionSpatial, mNonSpatialChannel, mParticipantMapChanged, mPTT, mPTTDirty, mPTTIsToggle, mPump, mRenderDeviceDirty, mSessionP2P, mSessionResetOnClose, mSessionTerminateRequested, mSpatialCoordsDirty, mSpeakerVolume, mSpeakerVolumeDirty, mTuningCaptureRunning, mTuningEnergy, mTuningMicVolume, mTuningMicVolumeDirty, mTuningMode, mTuningSpeakerVolume, mTuningSpeakerVolumeDirty, mUsePTT, mUserPTTState, mVivoxErrorStatusCode, mVoiceEnabled, mVolumeDirty, mWriteInProgress, NULL, setCaptureDevice(), setPTTKey(), setRenderDevice(), setState(), setVoiceVolume(), stateDisabled, and voice_prefs_listener. Definition at line 910 of file llvoiceclient.cpp. Definition at line 2094 of file llvoiceclient.cpp. References llendl, llinfos, and mCaptureDevices. Definition at line 3178 of file llvoiceclient.cpp. Definition at line 3918 of file llvoiceclient.cpp. Definition at line 3030 of file llvoiceclient.cpp. References IDFromName(), llendl, llinfos, LLVoiceClient::participantState::mAvatarID, LLVoiceClient::participantState::mAvatarIDValid, mParticipantMap, mParticipantMapChanged, LLVoiceClient::participantState::mURI, NULL, and updateMuteState(). Definition at line 2134 of file llvoiceclient.cpp. References llendl, llinfos, and mRenderDevices. Definition at line 3941 of file llvoiceclient.cpp. Definition at line 3340 of file llvoiceclient.cpp. Definition at line 3001 of file llvoiceclient.cpp. Definition at line 2540 of file llvoiceclient.cpp. References llendl, llinfos, mCaptureDevice, and mCommandCookie. Referenced by sendPositionalUpdate(), and stateMachine(). Definition at line 2551 of file llvoiceclient.cpp. References llendl, llinfos, mCommandCookie, and mRenderDevice. Definition at line 3333 of file llvoiceclient.cpp. Referenced by LLVoiceChannelP2P::activate(), and LLVoiceChannelP2P::setSessionHandle(). Definition at line 3548 of file llvoiceclient.cpp. Definition at line 2612 of file llvoiceclient.cpp. References findChannelURI(), llendl, llinfos, llwarns, mChannelName, and switchChannel(). Definition at line 1937 of file llvoiceclient.cpp. References mAccountHandle, mCommandCookie, and writeString(). Definition at line 2087 of file llvoiceclient.cpp. Referenced by refreshDeviceLists(), and LLVivoxProtocolParser::StartTag(). Definition at line 3173 of file llvoiceclient.cpp. Definition at line 2127 of file llvoiceclient.cpp. Definition at line 1893 of file llvoiceclient.cpp. Referenced by daemonDied(), giveUp(), stateMachine(), and terminate(). Definition at line 991 of file llvoiceclient.cpp. References gDirUtilp, LLDir::getExpandedFilename(), LLControlGroup::getString(), gSavedSettings, LL_PATH_LOGS, llendl, llinfos, mAccountServerURI, mCommandCookie, setState(), stateConnectorStarting, and writeString(). Definition at line 2565 of file llvoiceclient.cpp. References getState(), llendl, llwarns, mConnectorHandle, setState(), stateConnectorFailed, stateConnectorStarted, and stateConnectorStarting. Definition at line 1025 of file llvoiceclient.cpp. References mCommandCookie, mConnectorHandle, setState(), stateConnectorStopping, and writeString(). Referenced by stateMachine(), and terminate(). Definition at line 2749 of file llvoiceclient.cpp. References getState(), llendl, llwarns, mConnected, setState(), stateConnectorStopped, and stateConnectorStopping. Definition at line 2305 of file llvoiceclient.cpp. References closeSocket(), llendl, llwarns, removeAllParticipants(), setState(), and stateDisabled. Definition at line 3345 of file llvoiceclient.cpp. Definition at line 2281 of file llvoiceclient.cpp. Definition at line 3466 of file llvoiceclient.cpp. Definition at line 3487 of file llvoiceclient.cpp. References dist_vec(), LLVector3d::magVec(), mAvatarPosition, mCameraPosition, mCameraRequestedPosition, and mSpatialCoordsDirty. Definition at line 3184 of file llvoiceclient.cpp. Definition at line 3111 of file llvoiceclient.cpp. References mConnected, mParticipantMap, and NULL. Referenced by findParticipantByAvatar(), findParticipantByID(), participantPropertiesEvent(), and participantStateChangeEvent(). Definition at line 3131 of file llvoiceclient.cpp. References findParticipant(), LLVOAvatar::getID(), LLVoiceClient::participantState::mAvatarID, LLVoiceClient::participantState::mAvatarIDValid, mParticipantMapChanged, nameFromAvatar(), NULL, and updateMuteState(). Definition at line 3161 of file llvoiceclient.cpp. References findParticipant(), nameFromID(), and NULL. Referenced by getCurrentPower(), getDisplayName(), getGroupID(), getIsSpeaking(), getOnMuteList(), getPTTPressed(), getServiceType(), getUserVolume(), getUsingPTT(), getVoiceEnabled(), onAvatarNameLookup(), and setUserVolume(). Definition at line 3913 of file llvoiceclient.cpp. Definition at line 2102 of file llvoiceclient.cpp. Definition at line 2067 of file llvoiceclient.cpp. Referenced by refreshDeviceLists(), and stateMachine(). Definition at line 3355 of file llvoiceclient.cpp. References getState(), mSessionTerminateRequested, mSessionURI, and stateRunning. Definition at line 3789 of file llvoiceclient.cpp. Referenced by LLVoiceRemoteCtrl::draw(), LLVOAvatar::idleUpdate(), and LLSpeakerMgr::update(). Definition at line 3802 of file llvoiceclient.cpp. Definition at line 3900 of file llvoiceclient.cpp. Definition at line 3772 of file llvoiceclient.cpp. References FALSE, findParticipantByID(), LLFrameTimer::getElapsedTimeF32(), LLVoiceClient::participantState::mIsSpeaking, LLVoiceClient::participantState::mSpeakingTimeout, and SPEAKING_TIMEOUT. Definition at line 3843 of file llvoiceclient.cpp. References FALSE, findParticipantByID(), and LLVoiceClient::participantState::mOnMuteList. Definition at line 3105 of file llvoiceclient.cpp. Definition at line 3830 of file llvoiceclient.cpp. References FALSE, findParticipantByID(), and LLVoiceClient::participantState::mPTT. Definition at line 2141 of file llvoiceclient.cpp. Definition at line 2077 of file llvoiceclient.cpp. Definition at line 3887 of file llvoiceclient.cpp. References findParticipantByID(), LLVoiceClient::participantState::mServiceType, and serviceTypeUnknown. Definition at line 351 of file llvoiceclient.h. Referenced by connectorCreateResponse(), connectorShutdownResponse(), getCurrentChannel(), inProximalChannel(), inTuningMode(), joinSession(), leaveChannel(), login(), loginStateChangeEvent(), logoutResponse(), parcelChanged(), sessionCreateResponse(), sessionStateChangeEvent(), sessionTerminateResponse(), sessionTerminateSendMessage(), stateMachine(), switchChannel(), and tuningStart(). Definition at line 3583 of file llvoiceclient.cpp. Definition at line 3858 of file llvoiceclient.cpp. References f, findParticipantByID(), LLVoiceClient::participantState::mUserVolume, S32, and sqrtf. Referenced by LLFloaterIMPanel::draw(), and LLPanelActiveSpeakers::refreshSpeakers(). Definition at line 3815 of file llvoiceclient.cpp. Definition at line 3758 of file llvoiceclient.cpp. References FALSE, findParticipantByID(), and TRUE. Referenced by LLVOAvatar::idleUpdate(), LLVOAvatar::LLVOAvatar(), and LLSpeakerMgr::update(). Definition at line 2317 of file llvoiceclient.cpp. References closeSocket(), removeAllParticipants(), setState(), and stateJail. Definition at line 3434 of file llvoiceclient.cpp. References LLUUID::mData, LLStringBase< char >::replaceChar(), and UUID_BYTES. Referenced by addParticipant(), and sessionNewEvent(). Definition at line 1118 of file llvoiceclient.cpp. Definition at line 918 of file llvoiceclient.cpp. References LLSingleton< LLVoiceClient >::getInstance(), and mPump. Definition at line 3365 of file llvoiceclient.cpp. References getState(), mNonSpatialChannel, mSessionTerminateRequested, and stateRunning. Referenced by LLVOAvatar::idleUpdate(), LLVoiceChannelProximal::isActive(), LLSpeakerMgr::update(), and LLSpeakerMgr::updateSpeakerList(). Definition at line 2181 of file llvoiceclient.cpp. References getState(), stateMicTuningLoggedIn, and stateMicTuningNoLogin. Referenced by LLPanelDeviceSettings::draw(), tuningCaptureStartSendMessage(), tuningCaptureStopSendMessage(), tuningRenderStartSendMessage(), and tuningRenderStopSendMessage(). Definition at line 3286 of file llvoiceclient.cpp. References getState(), mNextP2PSessionURI, mNextSessionHandle, mNextSessionHash, mNextSessionNoReconnect, mNextSessionSpatial, mNextSessionURI, sessionTerminate(), and stateNoChannel. Definition at line 3703 of file llvoiceclient.cpp. References LLKeyboard::getKeyDown(), LLKeyboard::getKeyRepeated(), gKeyboard, KEY_NONE, mPTTIsMiddleMouse, mPTTIsToggle, mPTTKey, setUserPTTState(), and toggleUserPTTState(). Definition at line 3728 of file llvoiceclient.cpp. References LLKeyboard::getKeyDown(), gKeyboard, KEY_NONE, mPTTIsMiddleMouse, mPTTIsToggle, mPTTKey, and setUserPTTState(). Definition at line 3563 of file llvoiceclient.cpp. References getState(), mChannelName, sessionTerminate(), and stateRunning. Definition at line 3350 of file llvoiceclient.cpp. Referenced by LLVoiceChannelProximal::activate(), and LLVoiceChannelGroup::deactivate(). Definition at line 1097 of file llvoiceclient.cpp. References getState(), llendl, llerrs, llinfos, mAccountName, mAccountPassword, stateLoggedOut, and stateLoggingIn. Definition at line 2583 of file llvoiceclient.cpp. References llendl, llinfos, llwarns, mAccountHandle, setState(), stateLoginFailed, and stateLoginRetry. Definition at line 1899 of file llvoiceclient.cpp. References mAccountName, mAccountPassword, mCommandCookie, mConnectorHandle, and writeString(). Definition at line 2867 of file llvoiceclient.cpp. References getState(), llendl, llinfos, setState(), stateLoggedIn, and stateLoggingIn. Definition at line 1913 of file llvoiceclient.cpp. References logoutSendMessage(), mAccountPassword, setState(), and stateLoggingOut. Definition at line 2735 of file llvoiceclient.cpp. References getState(), llendl, llwarns, setState(), stateLoggedOut, and stateLoggingOut. Definition at line 1920 of file llvoiceclient.cpp. Definition at line 3738 of file llvoiceclient.cpp. References mPTTIsMiddleMouse, mPTTIsToggle, setUserPTTState(), and toggleUserPTTState(). Referenced by LLViewerWindow::handleMiddleMouseDown(), and LLViewerWindow::handleMiddleMouseUp(). Definition at line 3007 of file llvoiceclient.cpp. References mParticipantMap, p, and updateMuteState(). Definition at line 3402 of file llvoiceclient.cpp. Definition at line 3412 of file llvoiceclient.cpp. References LLBase64::encode(), LLStringBase< char >::replaceChar(), LLUUID::toCompressedString(), and UUID_BYTES. Referenced by findParticipantByID(), nameFromAvatar(), sipURIFromAvatar(), sipURIFromID(), and userAuthorized(). Definition at line 3928 of file llvoiceclient.cpp. Referenced by onAvatarNameLookup(), and stateMachine(). Definition at line 3951 of file llvoiceclient.cpp. References LLVoiceClientStatusObserver::ERROR_CHANNEL_FULL, LLVoiceClientStatusObserver::ERROR_CHANNEL_LOCKED, LLVoiceClientStatusObserver::ERROR_NOT_AVAILABLE, LLVoiceClientStatusObserver::ERROR_UNKNOWN, llendl, llinfos, mNonSpatialChannel, mSessionURI, mStatusObservers, mVivoxErrorStatusCode, LLVoiceClientStatusObserver::status2string(), and LLVoiceClientStatusObserver::STATUS_LEFT_CHANNEL. Definition at line 3994 of file llvoiceclient.cpp. References findParticipantByID(), gVoiceClient, llformat(), LLVoiceClient::participantState::mDisplayName, and notifyObservers(). Definition at line 3198 of file llvoiceclient.cpp. References gAgent, LLViewerRegion::getCapability(), LLAgent::getRegion(), getState(), llendl, llinfos, mCurrentParcelLocalID, mCurrentRegionName, LLHTTPClient::post(), and stateLoggedIn. Referenced by sessionStateChangeEvent(), and stateMachine(). Definition at line 2973 of file llvoiceclient.cpp. References findParticipant(), llendl, llwarns, LLVoiceClient::participantState::mIsSpeaking, LLVoiceClient::participantState::mPower, LLVoiceClient::participantState::mPTT, LLVoiceClient::participantState::mSpeakingTimeout, LLVoiceClient::participantState::mVolume, and LLFrameTimer::reset(). Definition at line 2937 of file llvoiceclient.cpp. References addParticipant(), findParticipant(), llendl, llinfos, LLVoiceClient::participantState::mAvatarID, LLVoiceClient::participantState::mName, NULL, and removeParticipant(). Definition at line 2294 of file llvoiceclient.cpp. References clearCaptureDevices(), clearRenderDevices(), getCaptureDevicesSendMessage(), and getRenderDevicesSendMessage(). Definition at line 3095 of file llvoiceclient.cpp. References llendl, llinfos, mParticipantMap, and removeParticipant(). Referenced by daemonDied(), giveUp(), sessionStateChangeEvent(), and stateMachine(). Definition at line 3923 of file llvoiceclient.cpp. Definition at line 3081 of file llvoiceclient.cpp. References llendl, llinfos, LLVoiceClient::participantState::mAvatarID, mParticipantMap, mParticipantMapChanged, and LLVoiceClient::participantState::mURI. Referenced by participantStateChangeEvent(), and removeAllParticipants(). Definition at line 3946 of file llvoiceclient.cpp. Definition at line 1080 of file llvoiceclient.cpp. References gAgent, LLViewerRegion::getCapability(), LLAgent::getRegion(), mVoiceEnabled, and LLHTTPClient::post(). Referenced by LLViewerVoiceAccountProvisionResponder::error(), and stateMachine(). Definition at line 2326 of file llvoiceclient.cpp. References a, buildSetCaptureDevice(), buildSetRenderDevice(), earLocAvatar, earLocCamera, earLocMixed, LLMatrix3::getFwdRow(), LLMatrix3::getLeftRow(), LLMatrix3::getUpRow(), llendl, llinfos, mAvatarPosition, mAvatarRot, mAvatarVelocity, mCameraPosition, mCameraRot, mCameraVelocity, mCaptureDeviceDirty, mCommandCookie, mConnectorHandle, mEarLocation, mMicVolume, mMicVolumeDirty, mParticipantMap, mPTT, mPTTDirty, mRenderDeviceDirty, mSessionHandle, mSpatialCoordsDirty, mSpeakerMuteDirty, mSpeakerVolume, mSpeakerVolumeDirty, LLVector3::mV, mVolumeDirty, p, u, VX, VY, VZ, and writeString(). Definition at line 2697 of file llvoiceclient.cpp. References llendl, llinfos, llwarns, mVivoxErrorStatusCode, mVivoxErrorStatusString, setState(), and stateJoinSessionFailed. Definition at line 1988 of file llvoiceclient.cpp. References llendl, llinfos, mCommandCookie, mNextP2PSessionURI, mNextSessionHandle, mNextSessionResetOnClose, mNextSessionSpatial, mNonSpatialChannel, mSessionHandle, mSessionP2P, mSessionResetOnClose, mSessionURI, and writeString(). Definition at line 2639 of file llvoiceclient.cpp. References getState(), llendl, llinfos, llwarns, mSessionHandle, mVivoxErrorStatusCode, mVivoxErrorStatusString, sessionTerminateByHandle(), setState(), stateJoiningSession, and stateJoinSessionFailed. Definition at line 1948 of file llvoiceclient.cpp. References LLURI::escape(), llendl, llinfos, mAccountHandle, mChannelName, mCommandCookie, mNextSessionHash, mNextSessionNoReconnect, mNextSessionResetOnClose, mNextSessionSpatial, mNextSessionURI, mNonSpatialChannel, mSessionP2P, mSessionResetOnClose, mSessionURI, and writeString(). Definition at line 2899 of file llvoiceclient.cpp. References LLIMMgr::computeSessionID(), gIMMgr, IDFromName(), IM_SESSION_P2P_INVITE, LLIMMgr::inviteToSession(), llendl, llinfos, llwarns, and LLStringBase< char >::null. Definition at line 2765 of file llvoiceclient.cpp. References getState(), llendl, llinfos, llwarns, mNextSessionHandle, mNextSessionSpatial, mNonSpatialChannel, mSessionHandle, mSessionResetOnClose, mSessionStateEventHandle, mSessionStateEventURI, mVivoxErrorStatusCode, mVivoxErrorStatusString, parcelChanged(), removeAllParticipants(), setState(), state2string(), stateJoiningSession, stateJoinSessionFailed, stateJoinSessionFailedWaiting, stateLeavingSession, stateRunning, stateSessionJoined, and stateSessionTerminated. Definition at line 2012 of file llvoiceclient.cpp. Referenced by joinSession(), leaveChannel(), switchChannel(), and tuningStart(). Definition at line 2053 of file llvoiceclient.cpp. References llendl, llinfos, mCommandCookie, and writeString(). Referenced by declineInvite(), sessionCreateResponse(), and sessionTerminateSendMessage(). Definition at line 2720 of file llvoiceclient.cpp. References getState(), llendl, llwarns, setState(), stateLeavingSession, and stateSessionTerminated. Definition at line 2017 of file llvoiceclient.cpp. References getState(), llendl, llinfos, llwarns, mSessionHandle, mSessionURI, sessionTerminateByHandle(), setState(), stateJoiningSession, stateJoinSessionFailed, stateJoinSessionFailedWaiting, stateLeavingSession, stateNoChannel, stateRunning, stateSessionJoined, and stateSessionTerminated. Definition at line 3527 of file llvoiceclient.cpp. References dist_vec(), mAvatarPosition, mAvatarRot, mAvatarVelocity, and mSpatialCoordsDirty. Definition at line 3510 of file llvoiceclient.cpp. References mCameraRequestedPosition, mCameraRot, mCameraVelocity, and mSpatialCoordsDirty. Definition at line 2107 of file llvoiceclient.cpp. Referenced by LLVoiceClientPrefsListener::handleEvent(), and LLVoiceClient(). Definition at line 3654 of file llvoiceclient.cpp. References llendl, llinfos, mEarLocation, and mSpatialCoordsDirty. Definition at line 3680 of file llvoiceclient.cpp. References f, mMicVolume, and mMicVolumeDirty. Definition at line 3573 of file llvoiceclient.cpp. Definition at line 3306 of file llvoiceclient.cpp. Referenced by LLVoiceChannelGroup::activate(), and LLVoiceChannelGroup::setChannelInfo(). Definition at line 3625 of file llvoiceclient.cpp. Definition at line 3637 of file llvoiceclient.cpp. References KEY_NONE, LLKeyboard::keyFromString(), mPTTIsMiddleMouse, and mPTTKey. Definition at line 2146 of file llvoiceclient.cpp. Definition at line 3313 of file llvoiceclient.cpp. References llendl, llinfos, mAreaVoiceDisabled, mNextSessionSpatial, mNonSpatialChannel, mSpatialSessionURI, and switchChannel(). Referenced by LLViewerParcelVoiceInfo::post(), and LLVoiceClientCapResponder::result(). Definition at line 1202 of file llvoiceclient.cpp. References llendl, llinfos, mState, and state2string(). Referenced by connectorCreate(), connectorCreateResponse(), connectorShutdown(), connectorShutdownResponse(), daemonDied(), giveUp(), LLVoiceClient(), loginResponse(), loginStateChangeEvent(), logout(), logoutResponse(), sessionConnectResponse(), sessionCreateResponse(), sessionStateChangeEvent(), sessionTerminateResponse(), sessionTerminateSendMessage(), and stateMachine(). Definition at line 3615 of file llvoiceclient.cpp. Definition at line 3578 of file llvoiceclient.cpp. Referenced by keyDown(), keyUp(), middleMouseState(), LLVoiceRemoteCtrl::onBtnTalkHeld(), and LLVoiceRemoteCtrl::onBtnTalkReleased(). Definition at line 3872 of file llvoiceclient.cpp. References f, findParticipantByID(), llclamp(), LLVoiceClient::participantState::mUserVolume, mVolumeDirty, LLVoiceClient::participantState::mVolumeDirty, S32, and TRUE. Referenced by LLFloaterIMPanel::onVolumeChange(), and LLPanelActiveSpeakers::onVolumeChange(). Definition at line 3690 of file llvoiceclient.cpp. Definition at line 3593 of file llvoiceclient.cpp. References LLVoiceChannel::activate(), LLVoiceChannel::getCurrentVoiceChannel(), and mVoiceEnabled. 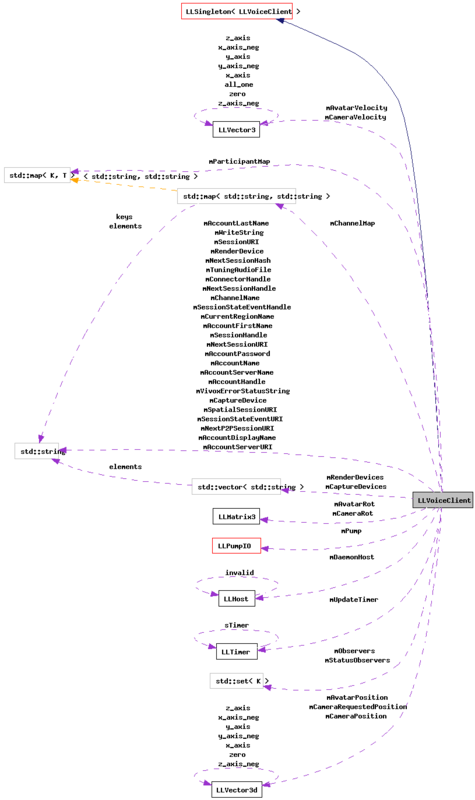 Referenced by LLVoiceClientPrefsListener::handleEvent(), and stateMachine(). Definition at line 3665 of file llvoiceclient.cpp. References f, mSpeakerMuteDirty, mSpeakerVolume, and mSpeakerVolumeDirty. Referenced by audio_update_volume(), and LLVoiceClient(). Definition at line 3388 of file llvoiceclient.cpp. References LLVOAvatar::getID(), mAccountServerName, and nameFromID(). Definition at line 3377 of file llvoiceclient.cpp. Referenced by answerInvite(), and callUser(). Definition at line 3471 of file llvoiceclient.cpp. Referenced by sessionStateChangeEvent(), setState(), and switchChannel(). Definition at line 1209 of file llvoiceclient.cpp. References LLPumpIO::addChain(), LLMuteList::addObserver(), buildSetCaptureDevice(), buildSetRenderDevice(), closeSocket(), CONNECT_THROTTLE_SECONDS, connectorCreate(), connectorShutdown(), LLSocket::create(), enforceTether(), LLVoiceClientStatusObserver::ERROR_UNKNOWN, FALSE, gAgent, gAPRPoolp, gDirUtilp, gDisableVoice, gDisconnected, LLViewerParcelMgr::getAgentParcel(), LLDir::getAppRODataDir(), LLViewerRegion::getCapability(), getCaptureDevicesSendMessage(), LLDir::getDirDelimiter(), LLParcel::getLocalID(), LLViewerRegion::getName(), LLAgent::getRegion(), getRenderDevicesSendMessage(), getState(), LLControlGroup::getString(), LLControlGroup::getU32(), gMuteListp, gParcelMgr, gSavedSettings, LLTimer::hasExpired(), i, isGatewayRunning(), killGateway(), llendl, llinfos, LLVivoxProtocolParser, llwarns, LOGIN_RETRY_SECONDS, loginSendMessage(), logout(), mAccountName, mAccountPassword, mAccountServerURI, MAX_LOGIN_RETRIES, mCaptureDevice, mCaptureDeviceDirty, mCommandCookie, mConnected, mCurrentParcelLocalID, mCurrentRegionName, mDaemonHost, mLoginRetryCount, mMuteMic, mNextSessionHandle, mNextSessionSpatial, mNextSessionURI, mNonSpatialChannel, mParticipantMapChanged, mPTT, mPTTDirty, mPump, mRenderDevice, mRenderDeviceDirty, mSessionHandle, mSessionP2P, mSessionTerminateRequested, mSocket, mSpatialCoordsDirty, mSpeakerVolumeDirty, mTuningCaptureRunning, mTuningMicVolume, mTuningMicVolumeDirty, mTuningMode, mTuningSpeakerVolume, mTuningSpeakerVolumeDirty, mUpdateTimer, mUsePTT, mUserPTTState, mutelist_listener, mVivoxErrorStatusCode, mVivoxErrorStatusString, mVoiceEnabled, mVolumeDirty, NEVER_CHAIN_EXPIRY_SECS, notifyObservers(), notifyStatusObservers(), NULL, parcelChanged(), removeAllParticipants(), requestVoiceAccountProvision(), s, S32, sendPositionalUpdate(), sessionConnectSendMessage(), sessionCreateSendMessage(), sessionTerminateSendMessage(), setState(), LLTimer::setTimerExpirySec(), setVoiceEnabled(), sMuteListListener_listening, LLTimer::start(), LLFile::stat(), stateConnecting, stateConnectorFailed, stateConnectorFailedWaiting, stateConnectorStart, stateConnectorStarted, stateConnectorStarting, stateConnectorStopped, stateConnectorStopping, stateDaemonLaunched, stateDisabled, stateIdle, stateJail, stateJoiningSession, stateJoinSessionFailed, stateJoinSessionFailedWaiting, stateLeavingSession, stateLoggedIn, stateLoggedOut, stateLoggingIn, stateLoggingOut, stateLoginFailed, stateLoginFailedWaiting, stateLoginRetry, stateLoginRetryWait, stateMicTuningLoggedIn, stateMicTuningNoLogin, stateNeedsLogin, stateNoChannel, stateRunning, stateSessionConnect, stateSessionCreate, stateSessionJoined, stateSessionTerminated, stateStart, LLVoiceClientStatusObserver::STATUS_JOINED, LLVoiceClientStatusObserver::STATUS_JOINING, LLVoiceClientStatusObserver::STATUS_LEFT_CHANNEL, LLVoiceClientStatusObserver::STATUS_LOGGED_IN, LLVoiceClientStatusObserver::STATUS_LOGIN_RETRY, LLSocket::STREAM_TCP, tuningCaptureStartSendMessage(), tuningCaptureStopSendMessage(), UPDATE_THROTTLE_SECONDS, and writeString(). Definition at line 3220 of file llvoiceclient.cpp. References getState(), llendl, llinfos, mNextP2PSessionURI, mNextSessionHandle, mNextSessionHash, mNextSessionNoReconnect, mNextSessionSpatial, mNextSessionURI, mSessionTerminateRequested, mSessionURI, sessionTerminate(), state2string(), stateJoinSessionFailed, stateJoinSessionFailedWaiting, and stateNoChannel. Referenced by callUser(), channelGetListResponse(), leaveNonSpatialChannel(), setNonSpatialChannel(), and setSpatialChannel(). Definition at line 924 of file llvoiceclient.cpp. References closeSocket(), connectorShutdown(), gVoiceClient, logout(), NULL, and sessionTerminateSendMessage(). Definition at line 3588 of file llvoiceclient.cpp. Referenced by keyDown(), middleMouseState(), and LLVoiceRemoteCtrl::onBtnTalkClicked(). Definition at line 2225 of file llvoiceclient.cpp. References inTuningMode(), mCommandCookie, mTuningCaptureRunning, and writeString(). Definition at line 2241 of file llvoiceclient.cpp. Definition at line 2276 of file llvoiceclient.cpp. Definition at line 2195 of file llvoiceclient.cpp. References inTuningMode(), mCommandCookie, mTuningAudioFile, and writeString(). Definition at line 2211 of file llvoiceclient.cpp. Definition at line 2256 of file llvoiceclient.cpp. References f, mTuningMicVolume, and mTuningMicVolumeDirty. Definition at line 2266 of file llvoiceclient.cpp. References f, mTuningSpeakerVolume, and mTuningSpeakerVolumeDirty. Definition at line 2167 of file llvoiceclient.cpp. References getState(), mTuningMode, sessionTerminate(), and stateNoChannel. Definition at line 2176 of file llvoiceclient.cpp. Definition at line 3067 of file llvoiceclient.cpp. References LLMute::flagVoiceChat, gMuteListp, LLMuteList::isMuted(), mVolumeDirty, and p.
Referenced by addParticipant(), findParticipantByAvatar(), and muteListChanged(). Definition at line 1044 of file llvoiceclient.cpp. References LLControlGroup::getString(), gSavedSettings, gUserServerChoice, gUserServerName, llendl, llinfos, mAccountDisplayName, mAccountFirstName, mAccountLastName, mAccountName, mAccountServerName, mAccountServerURI, nameFromID(), sConnectingToAgni, LLStringBase< char >::toLower(), USERSERVER_AGNI, and USERSERVER_OTHER. Definition at line 3610 of file llvoiceclient.cpp. References gDisableVoice, LLControlGroup::getBOOL(), and gSavedSettings. Referenced by LLFloaterIMPanel::draw(), LLFloaterChatterBox::getCurrentVoiceFloater(), LLSpeakerMgr::isVoiceActive(), LLViewerChatterBoxInvitation::post(), and LLOverlayBar::refresh(). Definition at line 948 of file llvoiceclient.cpp. References daemonDied(), llendl, llwarns, MAX_STRING, mConnected, mSocket, and size. Referenced by channelGetListSendMessage(), connectorCreate(), connectorShutdown(), getCaptureDevicesSendMessage(), getRenderDevicesSendMessage(), loginSendMessage(), logoutSendMessage(), sendPositionalUpdate(), sessionConnectSendMessage(), sessionCreateSendMessage(), sessionTerminateByHandle(), stateMachine(), tuningCaptureStartSendMessage(), tuningCaptureStopSendMessage(), tuningRenderStartSendMessage(), and tuningRenderStopSendMessage(). Definition at line 364 of file llvoiceclient.h. Definition at line 368 of file llvoiceclient.h. Definition at line 369 of file llvoiceclient.h. Definition at line 408 of file llvoiceclient.h. Referenced by channelGetListSendMessage(), loginResponse(), logoutSendMessage(), and sessionCreateSendMessage(). Definition at line 370 of file llvoiceclient.h. Definition at line 366 of file llvoiceclient.h. Referenced by login(), loginSendMessage(), stateMachine(), and userAuthorized(). Definition at line 367 of file llvoiceclient.h. Referenced by login(), loginSendMessage(), logout(), and stateMachine(). Definition at line 412 of file llvoiceclient.h. Referenced by setVivoxDebugServerName(), sipURIFromAvatar(), sipURIFromID(), sipURIFromName(), and userAuthorized(). Definition at line 413 of file llvoiceclient.h. Referenced by connectorCreate(), stateMachine(), and userAuthorized(). Definition at line 400 of file llvoiceclient.h. Referenced by getAreaVoiceDisabled(), LLVoiceClient(), and setSpatialChannel(). Definition at line 472 of file llvoiceclient.h. Referenced by enforceTether(), sendPositionalUpdate(), and setAvatarPosition(). Definition at line 474 of file llvoiceclient.h. Referenced by sendPositionalUpdate(), and setAvatarPosition(). Definition at line 473 of file llvoiceclient.h. Definition at line 467 of file llvoiceclient.h. Referenced by enforceTether(), and sendPositionalUpdate(). Definition at line 468 of file llvoiceclient.h. Referenced by enforceTether(), and setCameraPosition(). Definition at line 470 of file llvoiceclient.h. Referenced by sendPositionalUpdate(), and setCameraPosition(). Definition at line 469 of file llvoiceclient.h. Definition at line 423 of file llvoiceclient.h. Referenced by buildSetCaptureDevice(), setCaptureDevice(), and stateMachine(). Definition at line 425 of file llvoiceclient.h. Referenced by LLVoiceClient(), sendPositionalUpdate(), setCaptureDevice(), and stateMachine(). Definition at line 420 of file llvoiceclient.h. Referenced by addCaptureDevice(), clearCaptureDevices(), and getCaptureDevices(). Definition at line 437 of file llvoiceclient.h. Referenced by addChannelMapEntry(), clearChannelMap(), and findChannelURI(). Definition at line 399 of file llvoiceclient.h. Referenced by channelGetListResponse(), leaveChannel(), and sessionCreateSendMessage(). Definition at line 410 of file llvoiceclient.h. Referenced by buildSetCaptureDevice(), buildSetRenderDevice(), channelGetListSendMessage(), connectorCreate(), connectorShutdown(), getCaptureDevicesSendMessage(), getRenderDevicesSendMessage(), LLVoiceClient(), loginSendMessage(), logoutSendMessage(), sendPositionalUpdate(), sessionConnectSendMessage(), sessionCreateSendMessage(), sessionTerminateByHandle(), stateMachine(), tuningCaptureStartSendMessage(), tuningCaptureStopSendMessage(), tuningRenderStartSendMessage(), and tuningRenderStopSendMessage(). Definition at line 359 of file llvoiceclient.h. Referenced by closeSocket(), connectorShutdownResponse(), deviceSettingsAvailable(), findParticipant(), LLVivoxProtocolParser::process_impl(), stateMachine(), and writeString(). Definition at line 407 of file llvoiceclient.h. Referenced by connectorCreateResponse(), connectorShutdown(), loginSendMessage(), and sendPositionalUpdate(). Definition at line 404 of file llvoiceclient.h. Referenced by LLVoiceClient(), parcelChanged(), and stateMachine(). Definition at line 405 of file llvoiceclient.h. Referenced by parcelChanged(), and stateMachine(). Definition at line 357 of file llvoiceclient.h. Definition at line 497 of file llvoiceclient.h. Referenced by LLVoiceClient(), sendPositionalUpdate(), and setEarLocation(). Definition at line 415 of file llvoiceclient.h. Referenced by LLVoiceClient(), and stateMachine(). Definition at line 503 of file llvoiceclient.h. Referenced by LLVoiceClient(), sendPositionalUpdate(), and setMicGain(). Definition at line 504 of file llvoiceclient.h. Definition at line 484 of file llvoiceclient.h. Referenced by LLVoiceClient(), setMuteMic(), and stateMachine(). Definition at line 372 of file llvoiceclient.h. Referenced by joinSession(), sessionConnectSendMessage(), and switchChannel(). Definition at line 374 of file llvoiceclient.h. Referenced by joinSession(), sessionConnectSendMessage(), sessionStateChangeEvent(), stateMachine(), and switchChannel(). Definition at line 375 of file llvoiceclient.h. Referenced by joinSession(), sessionCreateSendMessage(), and switchChannel(). Definition at line 377 of file llvoiceclient.h. Referenced by joinSession(), LLVoiceClient(), sessionCreateSendMessage(), and switchChannel(). Definition at line 378 of file llvoiceclient.h. Referenced by LLVoiceClient(), sessionConnectSendMessage(), and sessionCreateSendMessage(). Definition at line 376 of file llvoiceclient.h. Referenced by joinSession(), LLVoiceClient(), sessionConnectSendMessage(), sessionCreateSendMessage(), sessionStateChangeEvent(), setSpatialChannel(), stateMachine(), and switchChannel(). Definition at line 373 of file llvoiceclient.h. Referenced by joinSession(), sessionCreateSendMessage(), stateMachine(), and switchChannel(). Definition at line 348 of file llvoiceclient.h. Referenced by inProximalChannel(), LLVoiceClient(), notifyStatusObservers(), sessionConnectSendMessage(), sessionCreateSendMessage(), sessionStateChangeEvent(), setSpatialChannel(), and stateMachine(). Definition at line 514 of file llvoiceclient.h. Definition at line 417 of file llvoiceclient.h. Referenced by addParticipant(), findParticipant(), getParticipantList(), muteListChanged(), removeAllParticipants(), removeParticipant(), and sendPositionalUpdate(). Definition at line 418 of file llvoiceclient.h. Referenced by addParticipant(), findParticipantByAvatar(), LLVoiceClient(), removeParticipant(), and stateMachine(). Definition at line 477 of file llvoiceclient.h. Referenced by LLVoiceClient(), sendPositionalUpdate(), and stateMachine(). Definition at line 476 of file llvoiceclient.h. Definition at line 480 of file llvoiceclient.h. Referenced by keyDown(), keyUp(), middleMouseState(), and setPTTKey(). Definition at line 482 of file llvoiceclient.h. Referenced by keyDown(), keyUp(), LLVoiceClient(), middleMouseState(), and setPTTIsToggle(). Definition at line 481 of file llvoiceclient.h. Referenced by keyDown(), keyUp(), and setPTTKey(). Definition at line 363 of file llvoiceclient.h. Referenced by init(), LLVoiceClient(), and stateMachine(). Definition at line 424 of file llvoiceclient.h. Referenced by buildSetRenderDevice(), setRenderDevice(), and stateMachine(). Definition at line 426 of file llvoiceclient.h. Referenced by LLVoiceClient(), sendPositionalUpdate(), setRenderDevice(), and stateMachine(). Definition at line 421 of file llvoiceclient.h. Referenced by addRenderDevice(), clearRenderDevices(), deviceSettingsAvailable(), and getRenderDevices(). Definition at line 409 of file llvoiceclient.h. Referenced by sendPositionalUpdate(), sessionConnectSendMessage(), sessionCreateResponse(), sessionStateChangeEvent(), sessionTerminateSendMessage(), and stateMachine(). Definition at line 402 of file llvoiceclient.h. Referenced by LLVoiceClient(), sessionConnectSendMessage(), sessionCreateSendMessage(), and stateMachine(). Definition at line 394 of file llvoiceclient.h. Referenced by LLVoiceClient(), sessionConnectSendMessage(), sessionCreateSendMessage(), and sessionStateChangeEvent(). Definition at line 380 of file llvoiceclient.h. Definition at line 381 of file llvoiceclient.h. Definition at line 347 of file llvoiceclient.h. Referenced by getCurrentChannel(), inProximalChannel(), LLVoiceClient(), sessionTerminate(), stateMachine(), and switchChannel(). Definition at line 401 of file llvoiceclient.h. Referenced by getCurrentChannel(), notifyStatusObservers(), sessionConnectSendMessage(), sessionCreateSendMessage(), sessionTerminateSendMessage(), and switchChannel(). Definition at line 358 of file llvoiceclient.h. Referenced by closeSocket(), stateMachine(), and writeString(). Definition at line 465 of file llvoiceclient.h. Referenced by enforceTether(), LLVoiceClient(), sendPositionalUpdate(), setAvatarPosition(), setCameraPosition(), setEarLocation(), and stateMachine(). Definition at line 392 of file llvoiceclient.h. Referenced by leaveNonSpatialChannel(), and setSpatialChannel(). Definition at line 500 of file llvoiceclient.h. Referenced by sendPositionalUpdate(), and setVoiceVolume(). Definition at line 501 of file llvoiceclient.h. Referenced by LLVoiceClient(), sendPositionalUpdate(), and setVoiceVolume(). Definition at line 499 of file llvoiceclient.h. 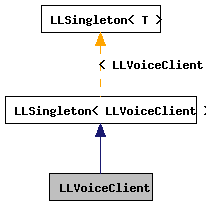 Referenced by LLVoiceClient(), sendPositionalUpdate(), setVoiceVolume(), and stateMachine(). Definition at line 346 of file llvoiceclient.h. Definition at line 519 of file llvoiceclient.h. Referenced by addStatusObserver(), notifyStatusObservers(), and removeStatusObserver(). Definition at line 385 of file llvoiceclient.h. Referenced by tuningRenderStartSendMessage(), and tuningRenderStopSendMessage(). Definition at line 390 of file llvoiceclient.h. Referenced by LLVoiceClient(), stateMachine(), tuningCaptureStartSendMessage(), and tuningCaptureStopSendMessage(). Definition at line 384 of file llvoiceclient.h. Referenced by auxAudioPropertiesEvent(), LLVoiceClient(), and tuningGetEnergy(). Definition at line 386 of file llvoiceclient.h. Referenced by LLVoiceClient(), stateMachine(), and tuningSetMicVolume(). Definition at line 387 of file llvoiceclient.h. Definition at line 383 of file llvoiceclient.h. Referenced by LLVoiceClient(), stateMachine(), tuningStart(), and tuningStop(). Definition at line 388 of file llvoiceclient.h. Referenced by LLVoiceClient(), stateMachine(), and tuningSetSpeakerVolume(). Definition at line 389 of file llvoiceclient.h. Definition at line 511 of file llvoiceclient.h. Definition at line 479 of file llvoiceclient.h. Referenced by LLVoiceClient(), setUsePTT(), and stateMachine(). Definition at line 483 of file llvoiceclient.h. Referenced by getUserPTTState(), LLVoiceClient(), setPTTIsToggle(), setUsePTT(), setUserPTTState(), stateMachine(), and toggleUserPTTState(). Definition at line 396 of file llvoiceclient.h. Referenced by LLVoiceClient(), notifyStatusObservers(), sessionConnectResponse(), sessionCreateResponse(), sessionStateChangeEvent(), and stateMachine(). Definition at line 397 of file llvoiceclient.h. Referenced by sessionConnectResponse(), sessionCreateResponse(), sessionStateChangeEvent(), and stateMachine(). Definition at line 506 of file llvoiceclient.h. Referenced by LLVoiceClient(), requestVoiceAccountProvision(), setVoiceEnabled(), and stateMachine(). Definition at line 488 of file llvoiceclient.h. Referenced by LLVoiceClient(), sendPositionalUpdate(), setUserVolume(), stateMachine(), and updateMuteState(). Definition at line 507 of file llvoiceclient.h. Definition at line 509 of file llvoiceclient.h. Definition at line 508 of file llvoiceclient.h. Definition at line 102 of file llvoiceclient.h. Referenced by LLVoiceRemoteCtrl::draw(), LLPanelDeviceSettings::draw(), LLPanelActiveSpeakers::refreshSpeakers(), and LLSpeakerMgr::update().